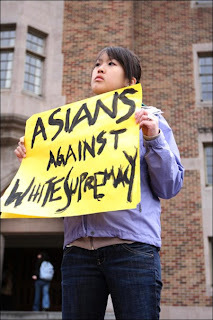 nick c. feldman : the blog: photo: I'm on Angry Asian Man! Hey guys, so I guess my photo of a Korean rights rally last week is making the rounds in Asian interest circles on the internet. It's posted on Angry Asian Man, titled "this photo is awesome" — check it out! who is this? what is the context? do you have other photos from the event? Could you post these up sometime? I don't follow your blog regularly so if you have others I've probably missed them.